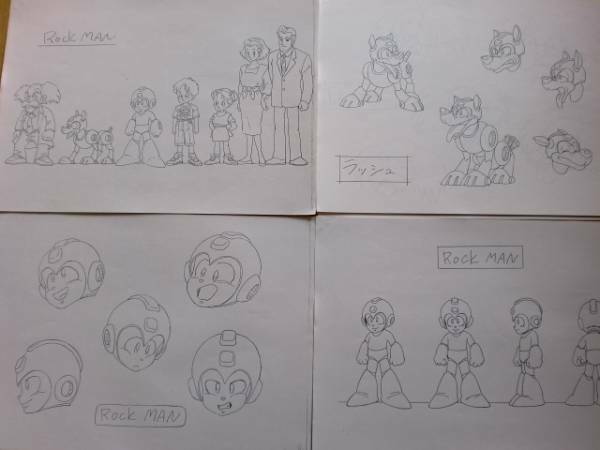 To those of you collected Rockman-related animation model sheets, it doesn't get much more rare than this. Currently up for bidding at Yahoo! 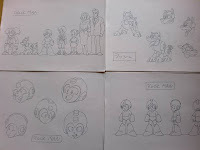 Auctions Japan, a series of production sketches from the famous Rockman: Upon A Star anime. 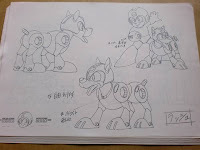 Model sheets are sort of a middle ground item, common on a number of auction sites. However, Upon A Star sheets are quite a sight. 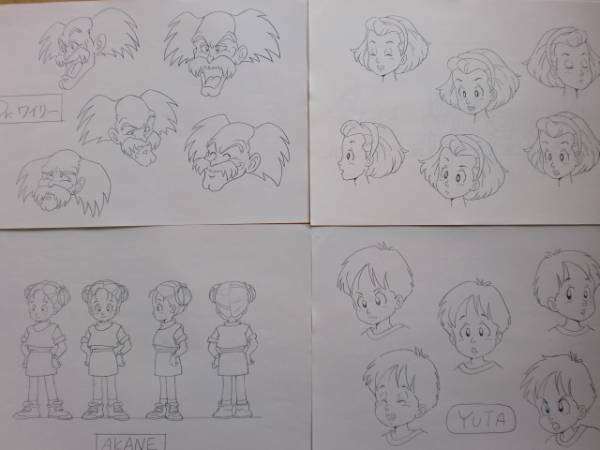 As you can see, the sheets boast sketches of the show's characters; animators would use these materials as a reference when animating the show. The depiction of characters in a number of poses and gestures helps the designers to standardize the continuity of a character's appearance from one scene to the next. The seller is offering a set of twenty sheets, all said to be in great condition, at a mere 100 Yen (roughly $1.18 US). With six days left to bid, there's no doubt that price will skyrocket in time. You can catch a peek of the auction here. If you want to bid, you'll have to go through a proxy -- a middleman service that's willing to bid on Japanese auctions such as Rinkya. These services usually require additional payments on top of the item's price tag so be ready to shell some dough. That said, feel free to have at it! Isn't that like selling pirated copies of a game? Does he have the licensing to sell copies of the art? It's different. They're replicas. All animation model sheets are replicas these days. Legit ones are SUPER rare. How do you tell the difference though? You could photocopy till my heart's content and no one would ever know....there's no way to know if it's a legit copy or a copy of a copy. No proof. It is hard to tell if they are selling pirated copies of the art. NO THANKS! I've brought it up in comments on Protodude's previous settei posts, but there is typically a way to tell fake copies from the original copies. All based on paper size and orientation. If they are on your typical 8.5 x 11 computer paper, they are fakes. Official settei paper is longer, although I don't have the exact measurements on me right now. If they are printed on the paper vertically, rather than horizontally, they are fakes. Just looking at these samples, it definitely appears legit. And the seller looks to have pretty flawless feedback, too. You've gotta remember in the art world, so much is sold in prints, which cost less. Originals can go for crazy amounts of money, regardless if it's a painting, a cel, a sketch, etc. The principle here is hardly any different. 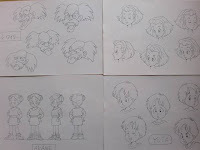 In animation, they have to create enough copies for all the animators to use for reference. So occasionally you'll see multiple copies of the same images up for sale, but they can both be legit, studio used memorabilia. Yes, caution is needed, but it is rare, cool to see artwork. It's not like you'd be throwing away thousands of dollars for these, but for 20 settei, $20-$60 wouldn't be out of the question, nor that expensive for each individual sheet. Man, the style of Upon A Star is so authentic to Rockman. 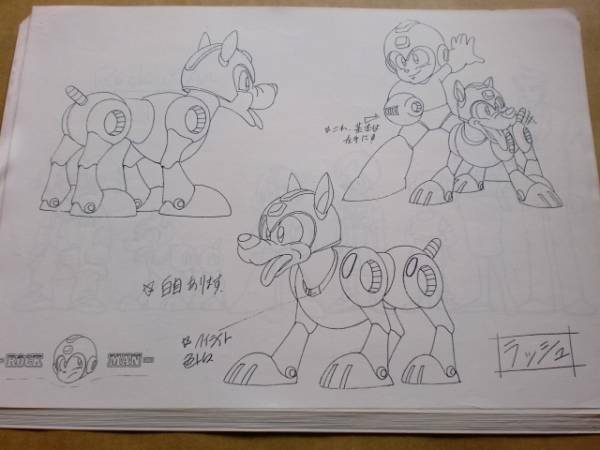 Rockman himself looks almost exactly like Inafune's sketches. I only wish more episodes had been made. These sketches are great. I'm a collector myself, and I'm aware of the concern of authenticity/rarity/etc. But honestly, I'd be happy with just a photocopy or scan of these. And the 64,000 Dollars Question: Why didn't the person just scan them in the first place. Answer probably has to do with a combination of Greed, Profit, or just cutting even. Nobody noticed that not only has this auction ended, but it ended for 100 yen? Quite a bargain for whoever just up and bought it.